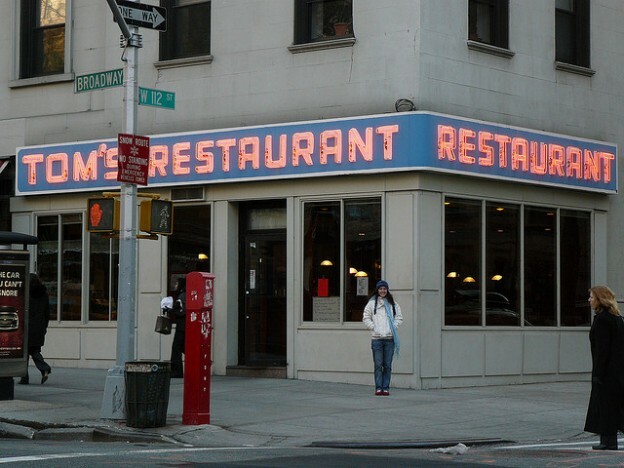 Tom's Restaurant is a Seinfeld icon. Could the show give us insight into the Internet's emotional landscape? Photo by Mercedes Bugarin and reused here with Creative Commons license. “I’m out there Jerry, and I’m lovin’ every minute of it!” Kramer, Jerry Seinfeld’s wacky neighbor, would roar as he walked into a scene. Kramer was also the television show’s happiest character, according to a mathematical analysis of the sitcom’s scripts conducted by Chris Danforth and Peter Dodds, University of Vermont mathematicians. The pair has been applying a ranking algorithm they’ve developed at UVM to rank the “happiness” of words in a large dataset. “Seinfeld” scripts were a fun trial run. Their happiness ranking system, which they and their colleagues at UVM’s Computational Story Lab have dubbed the Hedonometer, has been used to analyze Google searches, Twitter messages, movie scripts and song lyrics from around the world. "Could a statistical approach using big data be a better barometer for reading cultural mood?" Their work has applications for journalists who want to tap big data for stories with more firepower. Analyzing “Seinfeld” is a playful application of a powerful tool the mathematicians have developed to study positivity in language. Their argument is simple: The current methods for measuring mood or positivity vary widely across surveys, questionnaires, polls and other studies. Could a statistical approach using big data be a better barometer for reading cultural mood? The Hedonometer uses an algorithm to rank the appearance, frequency and relationship among words in a given sample. This ranking system was initially calibrated by hiring Amazon Mechanical Turk employees to score 10,000 words along a happiness ranking: “love,” “beauty” and “rainbow” score high; “ugly,” “hate” and “sick” rank low. Once they had a calibrated Hedonometer for the English language, they began running collections of texts through it. They looked at music lyrics as a way of inferring a nation’s mood. They looked at happiness in the blogosphere, finding, for example, that Michael Jackson’s death had resulted in a three-day low in the online mood. Lately, Danforth and Dodds have been researching the Twitter firehose, trying to make sense of some subset of the 500 million tweets that are sent out per day. They are currently analyzing tweets from U.S. states in real time. As of this last week, Maine is the happiest state. The UVM team recently started expanding this analysis worldwide. Together with an international team, they created lists of the 10,000 most common words used in 10 languages — English, Spanish, French, Brazilian Portuguese, German, Korean, Chinese, Indonesian, Russian, and Egyptian Arabic — based on Twitter messages, Google searches and books, television and movie scripts, and song lyrics in these languages. The French like to Google phrases with the words “heart,” “friends” and “love.” Brazilians on Twitter like to use the words “life,” “woman” and “happy.” Egyptian movie and television script writers often use the words “dad,” ”best” and “girl.” These word choices may come as no surprise. But what might is how often they are used. When weighed against each country’s negative word choices, these positive words win out. Based on this, the UVM team has concluded that there is an inherent positivity to human language. They published this data-driven analysis of 10 languages last month in the journal “Proceedings of the National Academy of Sciences.” Spanish was cited as the most positive language in the study. That language is biased toward positive words is a theory that goes back decades. In 1969, the “Pollyanna hypothesis” was developed by psychologists Jerry Boucher and Charles Osgood at the University of Illinois. The researchers determined that people were more likely to use positive words when they spoke. But Danforth and Dodds’ analysis uses big data, thousands upon thousands of words, to measure cultural sentiment, greatly expanding the sample size of cultural well-being studies. Our social nature is being encoded in real time in everything we post to the Internet. Tools like the Hedonometer are helping us make sense of what the world is saying online. For journalists, that’s good news. Aleszu Bajak is a journalist covering science, energy, the environment, and health across the Americas. He’s the founder and editor of LatinAmericanScience.org, a resource for science news out of Latin America. In 2013 he was awarded a Knight Science Journalism Fellowship at M.I.T., where he explored the interface between journalists, designers and developers. He now teaches journalism at Northeastern University’s Media Innovation program and edits Storybench.org, an under-the-hood guide to digital storytelling. Before freelance reporting from Latin America, he worked as a producer for the NPR talk show Science Friday. He writes for Nature, Science, New Scientist, and SciDevNet, among other outlets. This piece was initially published on Storybench, a cookbook for digital storytelling. Storybench is a collaboration between Northeastern University’s Media Innovation program, a new graduate degree in digital journalism, and Esquire magazine. Storybench provides an “under the hood” look at the latest and most inventive examples of digital creativity and the tools and innovation behind them. Follow Storybench on Twitter and Facebook.